This lovely hotel enjoys superb views from its excellent position on the cliff tops. It is quietly located for a great golfing holiday and yet the bustling town of Platya d'Aro is just a 15 minute walk from the hotel and the excellent Catalunya courses are within an easy drive. This delightful and traditional hotel overlooks the bay of Cadiz and offers the taste of 'real Spain' for golfers who enjoy experiencing the country's culture as well as its great golf courses! Part of the Elba chain, this luxury hotel is situated on the beach at Estepona, offering golfers a superb standard of hotel accommodation in a convenient location. Superb 'All Inclusive Plus' option available as well as some great golf packages including Valderrama and Finca Cortesin ! This superbly located hotel offers great value accommodation and is close to the centre of Puerto Banus, ideal if you are looking for lively nightlife lots of bars and restaurants. It boasts its own Casino too! A smart new 4 star hotel located on the beach in Estepona and conveniently placed to reach the golf courses at this Western end of the Costa del Sol. Great values Spetember and October Golf packages available with an 'All Inclusive' option ! Right next to the marina at Benalamadena with a host of bars and restaurants offering excellent nightlife for golfing groups and couples who like a livelier alternative to a golf resort holiday. Well situated right in the centre of Fuengirola opposite the harbour. 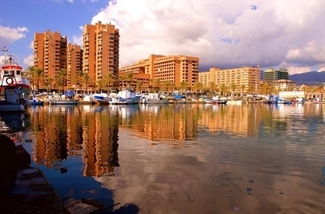 With the courses in easy driving distance and the lively nightlife of Fuengirola on the doorstep, this hotel is very popular with golfing groups. Ideally suited to golfing groups, the ever popular Flatotel International offers a welcoming reception to its guests, many of whom return year after year. A great value hotel for both families and groups. 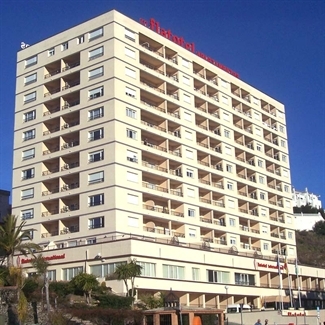 Located close enough to the nightlife of Fuengirola to be able to walk, but far enough out for easy parking! A short walk from the Marina at Puerto Banus, this aparthotel is popular with golf groups who want to play hard on the course during the day, and party in the port at night! The spacious studios and apartments offer good value for money. 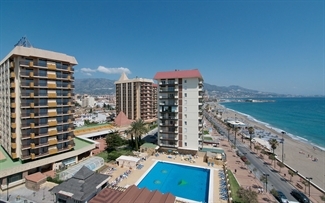 If it is lots of nightlife on your doorstep that you are after, then the great value Aparthotel Pyr Fuengirola, situated right on the sea-front could be the place for you.